In Little Wilbraham parish, down at Six Mile Bottom, Footpath 10 has now been officially diverted to run from the Social Club Car Park, alongside the railway (rather than taking a diagonal route across the field). The latter route had been impossible for some time, being obstructed by a 6 foot high chain-link fence. The route between the fence and the railway hedge/fence should be two metres (2m) wide, so we hope it will now be better maintained. On the 11 July, the 2-volume, 1000pp survey of the paths in South Cambs. was presented to Councellor Shona Johnstone, chairman of the Environment & Transport Committee. The survey, which is intended as an archival description of the path network in 1998 – 2000, had been made by 30 volunteers from Cambridge Group. The ceremony took place on the steps of Shire Hall, and was attended by about 20 ramblers, several County Council staff, inc. Brian Smith, head of Environment & Transport, Kate Day, leader of the Access Team (the recipient of all our complaints letters! ), and Karen Champion (who checks out on the ground the complaints in South Cambs. District). Janet Davis came from RA London Office to lend support. In introducing the report, Roger emphasised the improvements which had taken place in the local path network since the last full survey in 1982/3. Presently, about 85% of South Cambs. paths are in reasonable condition in the Summer. This falls to 75% in Winter, when farmers fail to reinstate cross-field paths. Other problems relate to overgrown or cultivated field-edge paths; damaged stiles or gates; missing or damaged signposts; misleading notices; difficult animals ; buildings and other obstructions; erosion; electric fences; and definitive map problems. Despite improvements over the last 10 years, we remain only too aware that without continued vigilance, the paths could easily deteriorate. The continuing inadequate County Council budget for path work also got a mention. Grateful thanks are offered to all those who helped with the survey, and who turned out for the presentation, which was organised for the RA by John Ratcliff. 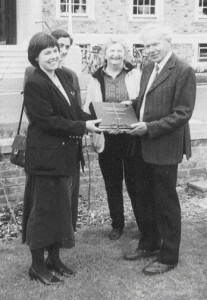 Presenting the Millennium Survey to Councillor Shona Johnstone, on behalf of RA Cambridge Group, 11 July 2000. Copies of the survey will be available for public inspection in the Archives Dept. at Shire Hall, and in Lion Yard Library. Copies have also been purchased by South Cambs. D.C. , The National Trust, The Cambridge Preservation Society, and by 3 Cambridge Colleges and two individuals. N.B. A few copies are available for sale at cost (£40 each!). The whole of East Anglia is now covered by the new OS Explorer (1:25 000 series), price £5.25. You will know that Heffers Map Shop in Sidney Street moved to the main Trinity Street shop in late Autumn, 1999. The space for maps & walking books is, sadly, much reduced. Heffers have been taken over by Blackwells, the Oxford Bookshop. Lovers of Fenland waterways may appreciate suggestions for further circular walks when they have completed the Fen Rivers Way with Roger & Janet (six walks on the RA programme Jan-Mar 2001). Other riverside circuits can be found in “Walks in East Cambridgeshire” published by the RA Cambridge Group, available at £4.50 from B. Hawes, 52 Maids Causeway, Cambridge CB5 8DD (cheques payable to the Ramblers’ Assoc. Cambridge Group, please), or from the Tourist Office and some bookshops in Cambridge. Of the 30 walks, 14 have a riverside section! The Iceni Way, The Nar Valley Way, and The Angles Way all have the theme of East Anglian Watercourses, and are reviewed here. The more northerly Hereward Way and Nene Way, and the Stour Valley Walk following the Essex Stour will be discussed in future issues. The Ramblers Association has produced a guide to the 80 mile long “Iceni Way”, running from Knettishall Heath to the coast at Heacham, and following sections of the Little Ouse & Great Ouse. This useful and attractive guidebook, containing accommodation list, and historical and nature notes, as well as helpful route notes and sketch maps, is obtainable from Ms S.Smith, Caldcleugh, Cake Street, Old Buckenham, Attleborough, NR17 1RU, £2.10 plus p/p. This is the most recently compiled of the “watery routes”, and comments from those who have completed the path would be welcomed. In November 1999, three members of the RA Cambridge Group followed the Nar Valley Way from Kings Lynn to its terminus near Gressinghall. This was probably later in the year than we had ever previously taken a walking holiday! But in spite of cold, intermittent strong winds, rain, and even a few flakes of snow, we much enjoyed this 34 mile walk over 3 days of limited daylight. The waymarked route starts on the historic waterfront at Kings Lynn, and follows the River Nar to Setchey Bridge, before taking a pleasant detour through Shouldham Warren. It passes the splendid gatehouse at Pentney Abbey (where the adjacent farm incorporates remains of an Augustinian priory), and a few miles upstream it encounters the remains of an old bone mill. This stretch of river is very lovely. At Narborough, we stayed overnight in a guesthouse with a roaring fire and a warm welcome. Both West Acre and Castle Acre are places to linger, with remains of two more priories, a castle, and attractive cottages, pubs and places to stay. We passed both East & West Lexham’s ancient churches with round towers. The church of St. Andrew, East Lexham is reputed to have the oldest round tower in Britain, dated c. 900A.D. The church is on a slight mound in a circular yard, surrounded by a ditch, suggesting a site for pagan worship converted to Christian activities in the C7th. In the dim light of a November day we sought to people this quiet place with some of these early East Anglians. Following the river to Litcham, we first photographed the amusing village sign, showing the red-coated figure of the master tanner, before seeking shelter from an icy shower in Litcham All Saints Church. The next section of the route, which included a section of long straight road, and then some slightly difficult-to-find paths, was the least satisfactory of the walk, but, coming to Mileham, we enjoyed viewing the earthworks of the castle, dating from Norman times. Our last view of the River Nar was by Wyken House, where a wooden footbridge spans the tiny stream. The source is inaccessible, about half-a-mile away. Beyond, we pressed on in the declining daylight to pause at the tiny C12th church (sadly, locked) of St Peter & St Paul, Bittering Parva, opposite the site of an abandoned medieval village. The main route finishes at Gressinghall (where there is a Union House museum), but it is possible to extend the walk into East Dereham. Norfolk County Council produces a free leaflet, “The Nar Valley Way“, but we also found a guidebook, “An Introduction to The Nar Valley Way” by Carol Andrews & Dennis Dear (Pathway Publishing, Kings Lynn, 1995) helpful & informative. Four members of RA Cambridge Group walked the Angles Way in Spring 1995 using 2 cars. The path was well-waymarked, and there were no serious problems, although overgrowth is known to be a difficulty on some sections later in the year. A guidebook to the Angles Way is available from Ms S.Smith, Caldcleugh, Cake Street, Old Buckenham, Attleborough, Norfolk, NR17 1RU at £2.15 including p/p (cheques payable to the Ramblers’ Association, Norfolk Area). Did you see the brief paragraph in “Rambler” (Summer, 2000, page 11) on the achievement of Janet Pake of Willingham, in walking ALL the 1376 public paths in South Cambs, in time for the Millennium? A longer congratulatory piece was contributed, noting that Janet was bitten by a dog in course of her explorations, and describing her wading through Bourn Brook in Toft, on bridleway 8, where there is no bridge. These more colourful details, and the photo of Janet waving an OS map, never saw the light of day. However, we send our congratulations to Janet on her achievement, and also thanks for all her input into the Millennium Survey. Another rambler, Judy Stoneley, also put in many days investigating with us the more difficult paths of South Cambs, and to Judy too, we owe a great debt. Swavesey PC have produced an illustrated walks leaflet, available at 50 pence from village shops. It provides local information, and gives suggested circuits & nature notes. The Quotation . . .
– Pathfinder Sheet 1028 (Haverhill & Clare); Explorer Sheets 209 & 210. The village sign stands at the crossroads near the war memorial, TL 633 432. It shows a castle built by Aubrey de Vere in the 11th century. Cross the road, and take a signed footpath across the fields towards the church, approaching the churchyard past an area of moats. There is a display board near the church giving the history of the village. Further circuits of various lengths are possible on a very dense path network, in gently rolling countryside on the border with Essex. This is a very active “P3” (parish paths partnership) parish, with 56 paths well maintained by two devoted workers, Jack Rixon & Alan Hardy.